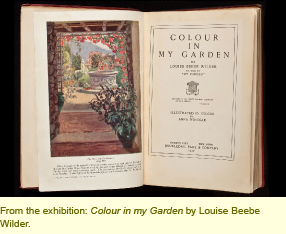 Co-curated by Elizabeth Barlow Rogers, president of the Foundation for Landscape Studies, and Harriet Shapiro, head of exhibitions at The New York Society Library, this exhibition contains a selection of volumes that constitute the best of a special genre of literature: the garden book informed by personal experience and a passionate love of nature and horticulture. Represented are works by Jane Loudon, Celia Thaxter, Gertrude Jekyll, Vita Sackville-West, Russell Page, Katharine S. White, and other hands-on gardener-writers. Writing the Garden: A Literary Conversation Across Two Centuries, published by the Foundation for Landscape Studies and the New York Society Library in association with David R. Godine, Publisher, amplifies the contents of the exhibition by placing in narrative context a wide array of books and authors. Considered here are the words of hands-on gardeners who write with their own gardens in full view. Ranging in time and place from Enlightenment France to modern-day New York City, they invite the reader into the natural world of soil and flowers, insects and sun, pride and frustration. Jean-Jacques Rousseau, Thomas Jefferson, Henry David Thoreau, Gertrude Jekyll, Vita Sackville-West, Russell Page, Lynden Miller, and Michael Pollan are among the fifty writers excerpted and discussed. 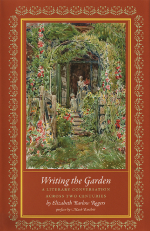 To order Writing the Garden: A Literary Conversation Across Two Centuries, please click here, print the form, and mail it to the Foundation for Landscape Studies at 7 West 81st Street, New York, NY 10024.